Atlas Editions advertised a London Transport RTW model in early 2008 via flyers in selected Sunday newspaper supplements, the model was advertised for £1.99 and supplied in an OOC style plastic display case with card outer box bearing both Atlas Editions & Corgi branding. This first version of the RTW doesn't appear to have resulted in any further models being offered to customers who purchased it, so one can only presume either the take up at the time wasn't deemed high enough or the takeover of Corgi by Hornby put the collection on hold. In early 2010 flyers once again appeared in Sunday supplements and various bus & model magazines, again an RTW model was offered for just £1.99, this at first glance appeared identical to the 2008 version but on closer inspection it was clear this was actually a new version bearing a different registration plate and additional front advertisements. The model was this time supplied in a more basic card box bearing a line drawing of the vehicle, it was however secured to a plastic plinth bearing a description of the model and operator. Responding to the flyer resulted in delivery of the model and details of seven further items, these were released at the rate of roughly one per month and although the second model was offered at an introductory price of £7.00 further releases were priced at £17.99 including P&P. The second model was also supplied with the following free gifts: Collectors Card Album & 12 Collectors Cards , Best of British Buses DVD, RTW Travel Clock & London Transport Cap Badge. Atlas Editions eventually issued a total of 31 models in the collection with the last model being issued in November 2012. 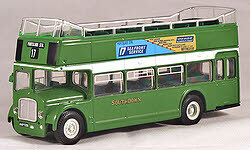 The models are branded as the Great British Buses Collection and were all based on existing OOC tooling. Apart from the Routemaster which was produced by Corgi, all the other models were manufactured by Atlas Editions themselves using tooling loaned to them by Corgi. The majority of the models are based on previous OOC releases but with minor alterations such as different registration numbers and route details however a number of the releases bear unique liveries exclusive to this collection. The models are also less detailed compared to standard OOC versions and often lack certain items such as driving mirrors, etched windscreen wipers and many of the smaller decals including some fleet numbers. The models and packaging don't actually carry any obvious reference codes but a small code is printed on the base of the box. I originally gave the models an unofficial GBBxx code which reflected the order in which the models were actually released, these codes are still shown on the individual bus collection model pages along with the official Atlas Editions Ref numbers. The release dates shown are the earliest known issue date for each model, in practice dispatch to some customers will have been much later based on the initial application date or variations in the order in which the individual models were dispatched. All the models were supplied with a four page leaflets containing photographs and details about the particular type of vehicle each model depicts. Collectors' Cards were also supplied with all but the last three models and these could be mounted in the supplied pair of albums. During early 2013 flyers appeared in some regional TV listing magazines advertising an OOC Burlingham Seagull Coach in Whittle & Sons colours. This is understood to be a test model to gauge whether there is sufficient demand for a possible future Great British Coach Collection of models. The model was dispatched to those who responded to the flyer in the Spring of 2013, along with details of five further models which appeared to include items from OOC, Oxford & EFE ranges. EFE however issued a statement making it clear they had no involvement with these Atlas models. Atlas subsequently announced that they had put the collection on hold, and none of the six advertised models were released. However in September 2015 they announced that the Whittle Burlingham Seagull coach was to be the first model in a new Classic Coaches Collection of UK & European coach models. The first model in this new series was issued in October 2015 and rather than use the existing OOC tooling as with the trial model, a new 1/72 scale tooling was used. At first it appeared all the models in this new collection would be based on 1/72 scale and it would include some of Atlas Editions earlier models released previously in other parts of Europe and new toolings of UK vehicles. After the first eight 1/72 scale models all the following UK based models were actually based on old 1/76 scale Corgi OOC castings. From model eighteen onwards the series seemed to switch away from true coach vehicles and more onto urban buses types that had previously been issued in the European Bus Collection in other parts of Europe. The collection ran to 31 models with the last being issued in January 2018. A single model was produced to test demand for this collection. Later model releases in this series included several bus rather than coach type vehicles. 7163 114 London Transport RTW London Transport RTW 75 KLB 915 25 Victoria Station ??? 201? One coach model was issued in this otherwise lorry focused collection. One coach model was issued in this varied collection of different vehicles.